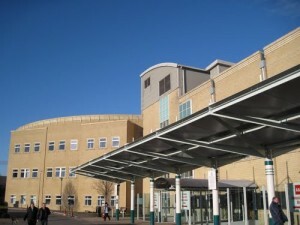 Calderdale & Huddersfield NHS Foundation Trust (CHFT) have two large acute Hospital sites: Calderdale Royal Hospital which is a relatively new Private Finance Initiative Hospital and the other in Kirklees. Whilst CHFT have other properties in their portfolio the two main sites produce the majority of carbon emissions. Nationally the NHS is committed to reducing CO2 emissions, which have dropped by 1m tonnes since the footprint was calculated in 2007. Conversion from a coal fired boiler to a gas-fired energy centre system at Huddersfield Royal Infirmary thus reducing carbon emissions by a third. This has resulted in a reduction in heavy transportation of coal and a cleaner environment for our staff, patients and neighbours. Significant reduction in waste sent to landfill due to improved segregation and alternative treatment. Local initiatives including recycling of aluminium, paper, cardboard, plastics. Energy initiatives for 2013/2014 includes significant capital spend on replacement chillers and the installation of plate heat exchangers at Huddersfield and the investigation into a combined heat and power plant at Calderdale Royal Hospital. The Trust understands need for on-going commitment to reduce carbon emissions and improve sustainability but also recognise the need to balance this approach with service development ensuring patient services are not compromised.